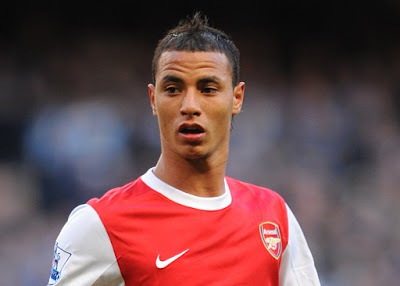 Ashburton Grove - Arsenal news and Arsenal opinion: Chamakh: "It’s impossible to learn English here. As for driving... I’ve tried..."
Chamakh: "It’s impossible to learn English here. As for driving... I’ve tried..."
Arsenal forward Maurone Chamakh has spoken of the teething trouble he's having adapting to life in England. "It's impossible to learn English here. "As for driving on the roads, I've tried, but I keep veering to the left. "Getting from the Emirates into town, I get someone to drive me." The 26-year-old has also admitted he'll be hiring two Moroccan cooks to feed him when he moves into his new home in Arkley, near Barnet, in three weeks time. However the issues he's having off the pitch aren't detracting from the enjoyment he's having on it, admitting Arsenal are the "club of my life," adding: "For others, it's Real or Barca. For me, it was always Arsenal." "You can see that I finish each match completely used up. I take an awful lot of knocks. "It's difficult, so I want to take an enormous amount of pleasure during four years. I'm proud to be a Gunner. "At the moment it's nothing but pleasure. Everything is exactly as I thought it was. "Whether it's the football, the football culture, the supporters, the passion or the game itself, the speed ... I haven't been disappointed." And the player himself is pleased with the progress he's made in the eleven starts and two substitute appearances he's made in Arsenal's 13 games this season, hitting the back of the net on six occasions. "In the beginning I put a bit too much pressure on myself because I was following in the footsteps of Thierry Henry and Emmanuel Adebayor. "Knowing that I've only ever known one club, I knew I'd need at least a season to adapt, but I'm ahead of schedule. "I never imagined I'd play as much, but with suspensions and injuries, I've taken advantage and that's helped me progress."